Created by the Sphax Team, PureBDCraft is a popular resource pack made famous by the Yogscast and other youtubers. Sphax PureBDCraft is designed to make mmminecraft look more of a wacky comic. It features high resolution, vector based textures. 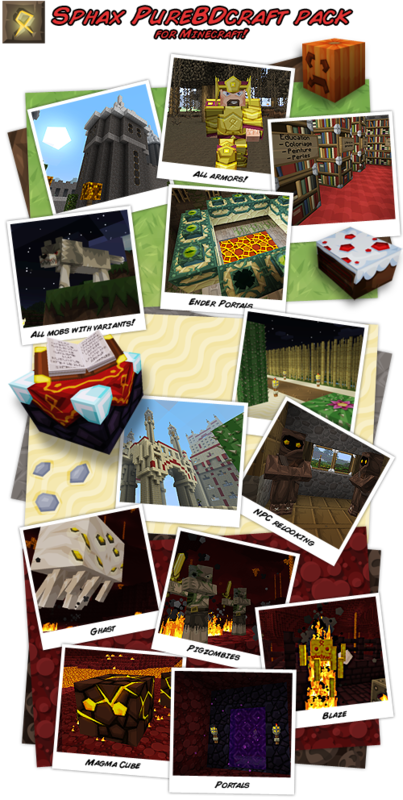 This texture pack is available in multiple resolutions from 16 x 16 to high definition 512 x 512. Because of its popularity, this texture pack almost never lost an update and is therefore up to date most of the times. Since it is based on a comic style art, this texture pack mostly features polygon shapes as its detail. Most noticeable shapes are squares, pentagons, triangles, and rectangles. Not only that, this resource pack also features extra textures for mods including the zipline mod, clay soldiers mod, and aether mod, among many others. The cartoonish theme of this resource pack is mostly focused around medieval fantasy age. This can be seen by the texture of the armor. Leather is equal to a ragged leather jerkin, iron armor has a texture of a heavy plated chest plate, while gold and diamond armors have textures of a heavy armor worn by kings and emperors during old times. This texture pack also features a lot of wacky characters such as the glaring look of the cows and pigs, the creepy face of the Endermen, and the nomadic look of the testificate villagers. Foliage and building blocks are also well-detailed, especially the crafted items and blocks such as crafting table, chests, and bookshelves. Even with its cartoonish graphics, PureBDCraft is best played on resolution of 128 x 128 or higher. What I love most about this pack is it does not only changes the texture, it also renames some of the items and adds a lot more content like added audio and animated objects/ items which makes it even more appealing. Overall, I highly recommend this resource pack to anyone who just want to make minecraft a better game. Did you find this texture pack awesome? We did. Share your thoughts by leaving a comment below.